Freddie Mercury was a great rock musician, showing supreme versatility in vocals, songwriting, and even piano playing. The man rose out of modest beginnings to become the frontman of the legendary band Queen. The music and showmanship of Freddie still resonates even over 20 years after his death. That’s not really Freddie’s vocals and we’ll never know his opinion of Cup of Noodles. The Nissin corporation, though, did seek out Gary Mullen, a very talented Freddie impersonator to sing a modified version of I Was Born to Love You. 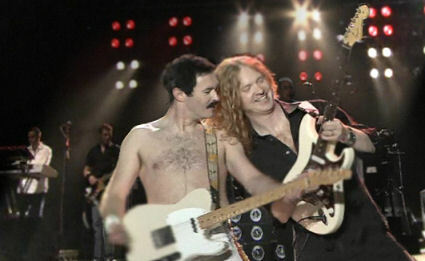 Through Mullen’s efforts, I’m convinced that it’s possible in 2013 to see a thrilling Freddie Mercury live performance. While Freddie can never be truly replaced, Gary Mullen and the Works provide an experience for those too young, or too young AND too American, to see an authentic Queen show in Freddie’s lifetime. I look forward to seeing Gary Mullen and the Works more than Queen+Adam Lambert or whoever the flamboyant singer-du-jour is. I hope I can bring you all something Freddie every Friday. Insert random but apropos Queen song lyric here. Statue photo by Bernd Brägelmann released under Creative Commons CC-BY-SA 3.0.